Every day, a first class flight. The Citation CJ3+ is a complete aircraft, ideal for those who want maximum comfort combined with high levels of efficiency. Its cabin and cockpit have been redesigned and now feature significant technological advances that provide an even more enjoyable experience for pilots and passengers. 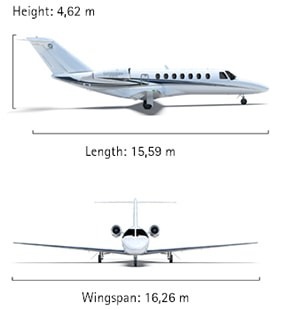 With a range of up to 3,778 km and a top speed of 770 km/h, the Citation CJ3+ is ideal for flights between the major cities of the country, without stopovers. The aircraft includes some of the most modern features currently available, including Garmin G3000 avionics, which offer advanced turbulence detection systems in conjunction with weather radar, as well as traffic alert (TCASII) and ground alert (TAWS-B). The Citation CJ3+ features a spacious cabin that can comfortably accommodate up to eight passengers. Highly precise, every detail of the model was designed to achieve maximum aerodynamic and, of course, aesthetic performance. Feel like you are in an extension of your office with the Citation CJ3+'s interior space details, such as central tables, seat reconfiguration for business occasions, plugs for mobile devices, Wi-Fi, and a carefully crafted finish.